Remember this guy? I have worked on this quilt top off and on for a couple of years. Even though it is very simple the pieces are small. Here is a close up. In case you want to make one the process is mindless. 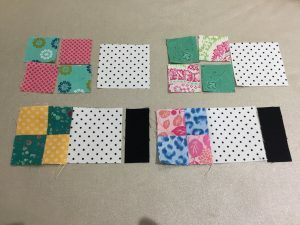 Just make four patches from 1 1/2″ squares. Square to 2 1/2″. 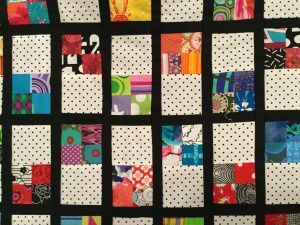 Connect to a 2 1/2″ solid (or in my case polka dot). After every set insert a 1″ x 2 1/2″ spacer. Alternate your block sets starting each row with a four patch or a solid. 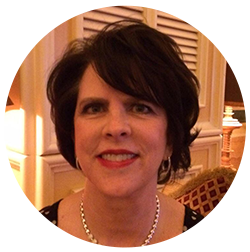 Insert a 1″ sashing strip between the rows. This does make a good leader/ender project or is good when you want to sew and not think too hard. 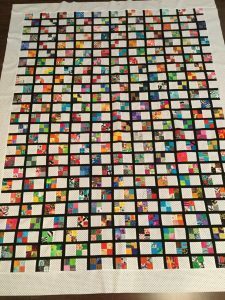 It would make a great baby quilt done in lighter colors. When the mood strikes I will quilt it. 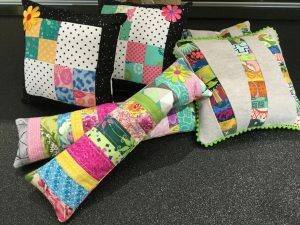 I told the ladies at Piecemakers By The Bay I would make them some pincushions for door prizes for their January quilt show. So I tried a few new ones. I make one of each for me and one for Piecemakers. The long skinny ones and the linen with birch tree strips are from Amanda Jean Nyberg’s new book “No Scrap Left Behind”. I really, really like this book and have several projects book marked. The other two are leftovers from my scrap quilt above. I just made a big four patch and bordered it. Easy way to use up leftover blocks. I love making pincushions and love giving them away. Even if you don’t sew you need a pincushion! That’s my goal – a pincushion in every home. The card bug bites again!